Peter Tork, one of the real musicians in The Monkees (guitarist) died today at the age of 77. They may have been a fake band, but Peter Tork was a real musician and player. His real born name was Peter Halsten Thorkelson, but assumably changed it to the stage name Peter Tork. We don’t know the official cause yet, but the guitarist had been diagnosed with a rare form of cancer a decade ago. May it be presumed it was a cancer relapse? The Monkees TV show started on September 12, 1966, on NBC. 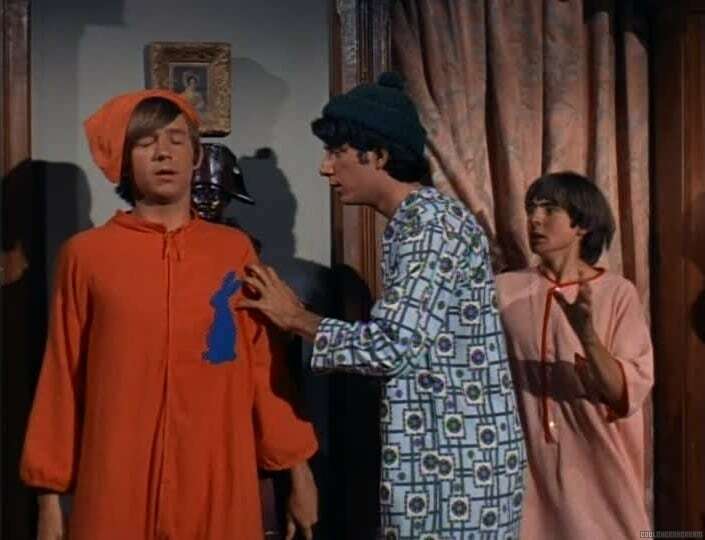 The series was shot by Screen Gems, and many of the same sets and props from The Three Stooges shorts were used on The Monkees: A pair of pajamas with a bunny design on the front that had been worn by Curly Howard in shorts such as Cactus Makes Perfect and In the Sweet Pie and Pie were the same ones worn by Peter Tork in various episodes such as “A Coffin Too Frequent” and “Monkee See, Monkee Die”. This entry was posted in television, Uncategorized and tagged monkees, television on February 21, 2019 by mattkprovideo. This is a youtube commercial I produced for Jamie Johnson Insurance in San Antonio, Texas. Written by Jamie Johnson and Viviane Maguire of Viv-Design. The voice over was done by Matthew Kordelski. It shot the video parts with a Canon G20 camcorder. I edited with Adobe After Effects and Adobe Premiere. The moving red arrow was animated in Adobe Animate ( Flash). This entry was posted in adobe animate, adobe photoshop, adobe premiere, after effects, animation, commercial, tv commercial, Uncategorized and tagged adobe after effects, adobe animate, adobe flash, adobe premiere, farmers insurance, flash animation, insurance, Jamie Johnson Insurance, television, TV Commercial, youtube on October 10, 2018 by mattkprovideo. This entry was posted in television, Uncategorized and tagged bbc, television, the young ones on September 24, 2018 by mattkprovideo. A television news segment on bicycle theft. They used hidden cameras, security cameras and a secret gps tracking device to catch the culprit. This entry was posted in documentary, Uncategorized and tagged bicycle, bike taxi, documentary, television on August 2, 2018 by mattkprovideo.